Synthetic-based lubricant for new generation low emission engines of tractors, other agricultural and earth moving machinery. a very high resistance to oxidation (oxidation stability). Ambra Unitek optimizes the protection of the DPF filter (Diesel Particulate Filter) keeping its efficiency high and preserving its life due to particular additives and the low volatility of the lubricant bases. 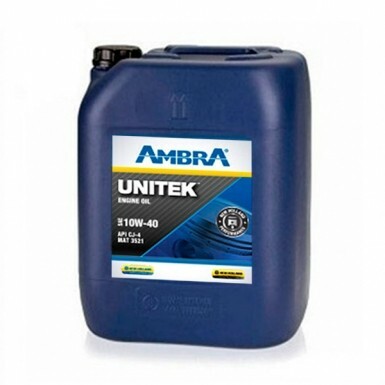 Ambra Unitek is perfectly usable also for engines fitted with other exhaust gas after treatment or recirculation systems or for engine with conventional technology. In addition to the above-mentioned reasons, Ambra Unitek has obtained the official technical approval of CNH also following stringent, very intensive bench and field tests that were prolonged for many working hours under severe operating conditions,in many areas of the world. Because of its SAE 10W-40 viscosity grade, this lubricant considerably improves engine starting at low temperatures (startability). The environment temperature range in which it can be used has been broadened and is the following: from -25°C to + 40 °C.